Remember that projects highlighted in pink are in progress by Brittany and ones that are in progress for Em are highlighted in green. When a project is completed the project will be crossed out and hopefully have a link next to it with our blog entry. 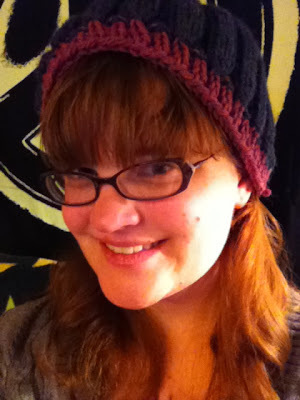 Today I am going to talk about the Twisted Ribbed Hat (Pattern 54). 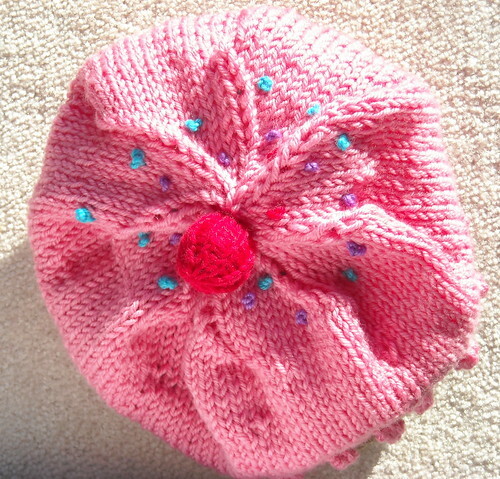 This pattern was my first top down hat. I must say I was pretty upset when I started this pattern. I tried making the ribbed bonnet (Pattern 16) and failed. 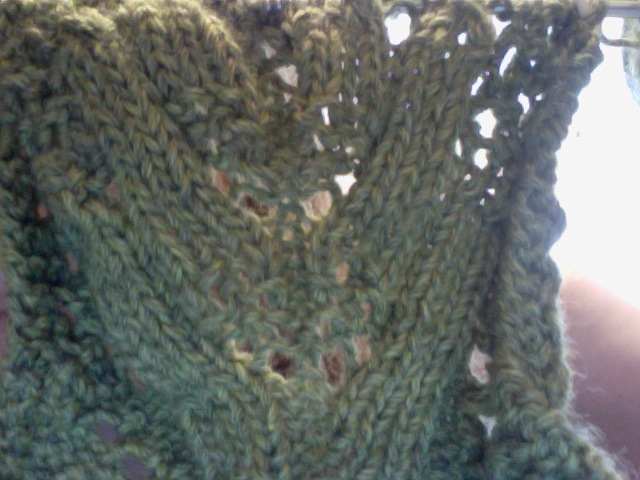 I didn't like starting with double points and then making more and more stitches. 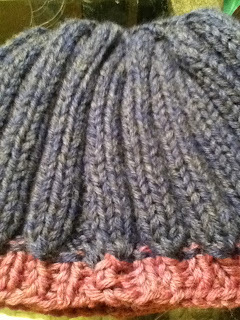 You actually double your yarn, which makes the knitting thicker and more difficult to do. It really bothered my hands, so I gave up and made Brittany do the project. Well, wouldn't you know this hat used the same technique? 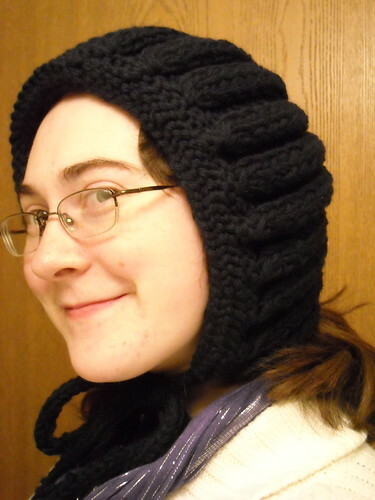 The Twisted Ribbed Hat and the Bonnet are siblings: the same designer made them both! 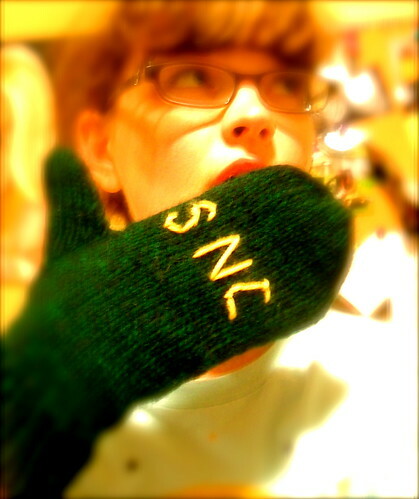 So once again, I casted on my stitches with my doubled yarn on my DPNS and went to work. 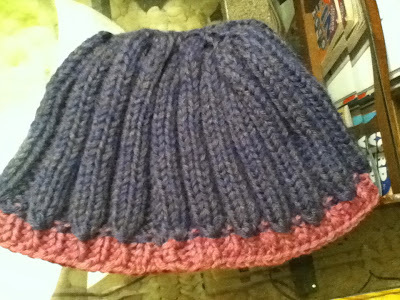 Determined to be able to do it, I worked on my hat. At first it was really hard to see how the hat was working out. You can see in the photo below how oddly shaped the first part of the hat actually was. I was pulling and pulling the stitches around my circular needle. The stitches were tight. I had the correct amount of stitches on the needle, but I think because I was so close to the top, the stitches were being pulled into several different directions. 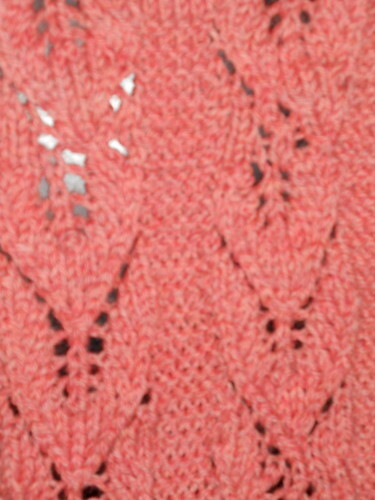 In the photo below I had to actually pull and adjust the stitches to go into a circle. 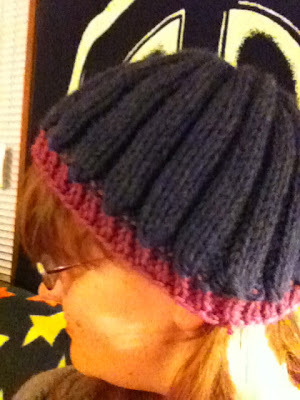 About an inch later into the pattern, the hat began to take the form of a hat all by itself. I just had to have patience! 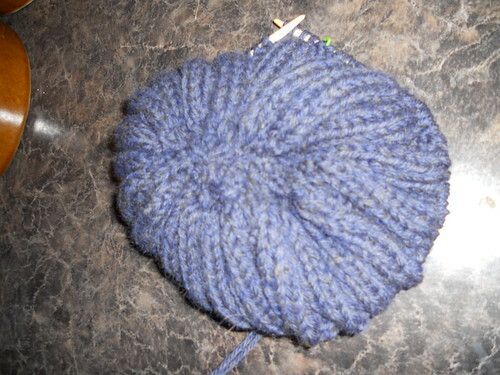 Then my circular needle broke....that was a bummer...I lost about 10 stitches of my hat. It was hard to fix because A/it was a little dark and B/I was trying to watch Tangled! I stopped my movie and worked on those stitches for about 30 minutes. After some work and creativity, I picked up my stitches. Then, I ran out of yarn! Once again, I failed to read the instructions and didn't see the 2 skein requirement. But to my defense, I don't think I've ever made a hat that required more than 1 skein!!! So when I ran out of yarn at 2:30AM, I just looked for another skein that would match. I found a nice wine purple to use for the bottom ribbing. I think it makes the hat look unique. That's all for now! Have a great one knitters!! Greetings Everybody It is Em! I'm so happy to say that A/we completed our finish five project goal and B/our "waiting to be started" is now officially under 10 projects! We really are on the downhill of our progress. Our goal to finish is the end of June 2012, so we are doing pretty good. I am going to set my own personal goal for the next month. My goal is to finish 2 projects in the 60 Quick Knits world. One MUST be part of my "in progress" projects that are just sitting and collecting dust. 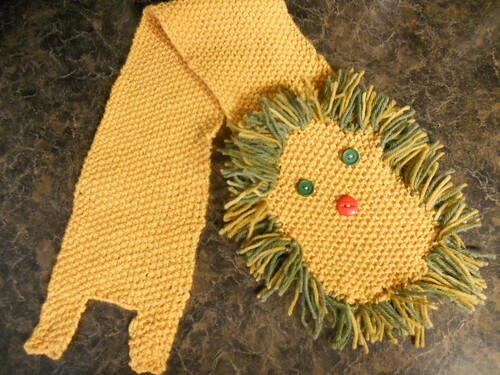 Today I am going to write about Project 8: the Lion Scarf. I really liked this project. It was a simple, fun and relaxing project to work on. 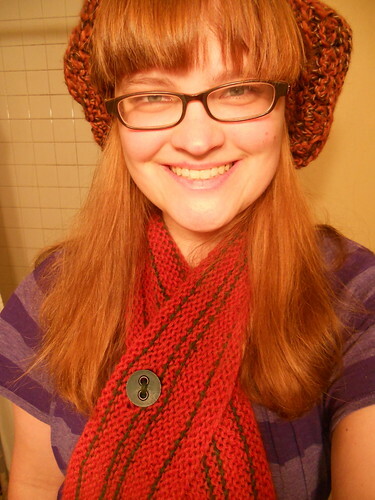 In fact, the majority of the time I was watching a movie while knitting this piece! What I love about (the original) 60 Quick Knits Book is that there is a very good balance of projects. 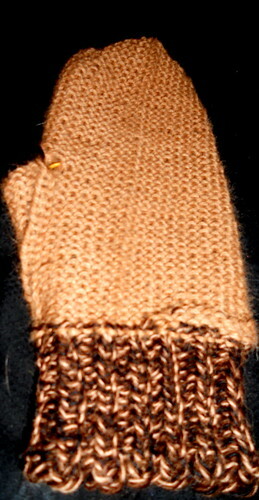 Some projects are indeed easy, such as this Lion Scarf while others are an enjoyable challenge (Leaf-Lace Gauntlets) I have not had much of an opportunity to work on any scarf with a seed stitch since I first started knitting. I feel that the seed stitch made this project interesting, verses just boring garter stitch. 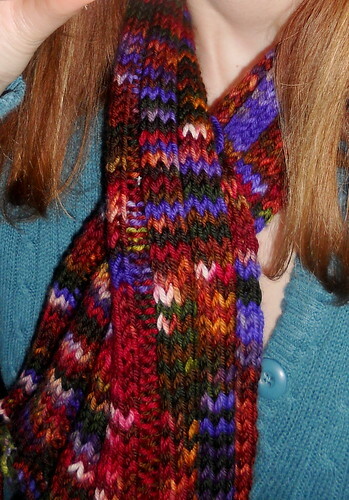 I made a video to describe how to put on the tassels for this scarf. I did this because I was struggling to find a great way to explain it written out. 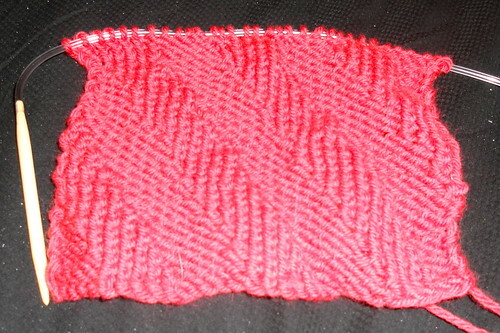 When I was first starting to knit, I had a really hard time with the finishing (wait...I still do!) and I wish that somebody told me how to do it instead of just looking at it in a book. I added extra commentary about the scarf as well too. I also learned how to add those little speech bubbles you see pop up on youtube videos, so you'll see some of my comments (and a little bit of my cheesy humor) pop up on that as well! Clink on the link to see the video! I mention in the video over and over again that "you need to plan" the right amount of the tassels. I would advise cutting about 3.5 inches of tassel instead of the advised 5 inches of tassel. I had so much that I was chopping off that I could have gotten away with doing it shorter. 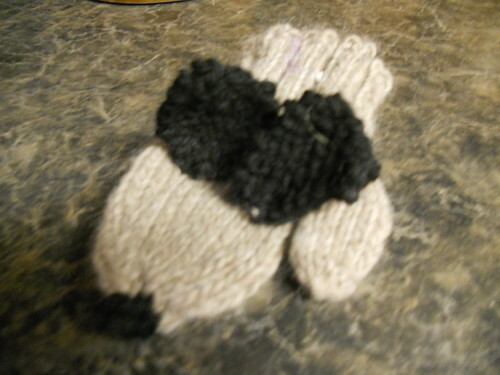 I also did not use a guideline, that is, a piece of yarn gently woven in where I was supposed to put the tassels. 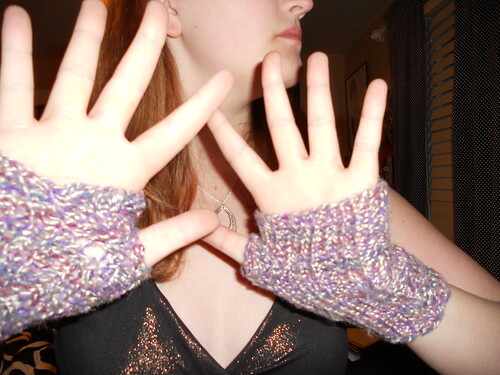 Also, if one feels that I did tassels differently, this was the way I learned how do to tassels. I find them to be quick to do when done in this fashion. Also, it still gives a clean edge. Finally, for the finished product, I didn't add the tail. I just don't like crocheting. (Sorry Brittany!). I picked out a button for a nose instead. I like buttons and I didn't want to go digging for a small piece of fabric, since I don't really have any fabric at home! I hope this helps!!! Have a wonderful day!